We deduce from the contents of this verse that it warns the unbelievers for ignoring the apparent miracles. The atheists’ basic contention is that matter has no beginning and that it is the matter that has generated everything, both living and inanimate things, by fortuitous act. The Big Bang Theory refutes the basic assertion of atheism in positing that the universe and time had a beginning. “Do not these disbelievers see that…?” is significant. And as it is implied by this verse, the fact that the heavens and the earth were in a state of unity before they were splited was something indeed conceivable by the human mind. The 1900s were the years during which scientific discoveries succeeded each other. Those were the years in which some people tried to point out the contradiction between science and religion. It was presumptuous of them as their whims had been indulged by the prosperity generated by the industrial revolution to idolize matter, daring to substitute it for God. The fact that matter was created – that it had had a beginning – as proven by the Big Bang Theory, was a blow for unbelievers. The concluding sentence of the verse “Will they not believe even then?” is significant in that history confirmed the truth of this and the unbelievers remained adamant despite evidence produced. The original unity of the universe is expressed by the Arabic word “ratq,” meaning the integrated state and the word “fatq,” signifying disintegration by separation. We have already mentioned that when Lemaître had posited this separation as described in the Quranic verse, his theory was first refuted. One of the contenders of this argument was Fred Hoyle. In the 1940s Fred Hoyle contended that if the Big Bang had effectively taken place there should have been a residue of the explosion, and asked that this fossil be shown. This satirical criticism led to the discovery of much evidence in support of the Big Bang Theory. The expression “fossil” which was mockingly uttered by Hoyle became the scientific proof for real evidence discovered later. While he was trying to debunk the theory of the Big Bang in a humorous way, he had unwittingly contributed to the confirmation of the Big Bang Theory. In 1948, George Gamow and his student Ralph Adler concluded that if the Big Bang Theory were true, it must have had a fossil left behind as Hoyle had claimed. According to their logic, the low-level background radiation must have existed in every direction since the universe had begun expanding in every direction following the Big Bang. Radiation other than that caused by the Big Bang must have had particular points in space from which it departed. But the radiation generated by such an explosion could not be traced back to a point. With the universe’s dynamic expansion radiation must have scattered in every direction. In the 1960s, the form of radiation imagined by Gamow and Adler was made the subject of research by a group of scientists with precision instruments at their disposal at Princeton University. However, what they had been looking for was to be discovered by others in a very interesting way. Arno Penzias and Robert Wilson were researchers at the Bell Telephone Company. One day, quite unexpectedly, they detected a uniform microwave radiation that suggested a residual thermal energy throughout the universe of about 3 Kelvin. At first Penzias and Wilson could not unravel the mystery. Surveys of the cosmic 3 Kelvin radiation indicated that it was perfectly uniform in all directions. The residue that Hoyle believed nonexistent had been found. So the Nobel Prize went to Penzias and Wilson. After Penzias and Wilson shared the Nobel Prize in 1965, the Cosmic Background Explorer (COBE) was rocketed into the sky in 1989. The data received from COBE confirmed the discovery of Penzias and Wilson. A great number of scientists evaluated the data produced by COBE as conclusive proof. Thus the process initiated by Lemaître in the 1920s was substantiated once again with new discoveries in the 1990s. 1400 years had elapsed since the revelation of the Quran and the satellite’s findings validated its statements. Supposing that we landed on a desert island and stumbled upon ashes: no one would doubt the fact that there had once been a fire on this island. The residue radiation that Penzias and Wilson ran across, and the COBE’s data, indicated the existence of the Big Bang. The contention by dissenters that the radiation scattered all over space had to be perfectly uniform in all directions is another indicator of the soundness of this evidence. One of the proofs substantiating the Big Bang Theory is related to the hydrogen-helium ratio in the universe. In the 1930s, astronomers, basing their studies on the fact that every celestial object emits a particular light, had recourse to a spectroscope to analyze the composition of the stars and galaxies. Calculations made by means of the spectroscope and mathematical formulas demonstrated that the universe, comprised an average of 73% hydrogen and 25% helium and 2% other gases like carbon and oxygen. Stars did not generate hydrogen and that much helium. Calculations made by scientists made it clear that 20%-30% of the helium must have been produced before the evolution of stars. Only the primordial fireball at the outset of the Big Bang could have generated such a light synthesis; the expectations in the wake of the Big Bang and the quantity of hydrogen and helium in space are just a few of the proofs validating the theory. Although the available scientific evidence is in itself sufficient to prove the Big Bang Theory, we are witnessing a steady increase of this evidence. A Big Bang medium was created in Switzerland at CERN (Conseil Européen pour la Recherche Nucléaire), the famous center that has the most powerful and versatile facilities of their kind in the world. The findings of the research carried out here lends further support to the theory. The law of thermodynamics supports the theory according to which the universe must have had a beginning; the second law of thermodynamics states that some processes in nature are irreversible and unidirectional, the direction being dictated by an overall increase in entropy. Thus, the energy grows less and less utilizable until it becomes of no profit. If the universe and matter had existed from eternity, the movement would have come to a standstill in eternal time. On the other hand, eternity does not pass; if it does, then it is no longer an eternity. In brief, the very fact that we happen to be at this point connotes the existence of a beginning. If we think that time was not created, the contradiction is inevitable and ends up with a dilemma. The only solution to the dilemma would be positing that time was created and that the universe must have had a beginning; these, as proved by the Big Bang Theory, are mutually validating evidences. COULD MUHAMMAD HAVE SENT A SATELLITE TO SPACE? We have witnessed the verification of data received from the satellites sent into space. How did it happen that the Prophet had an insight into the fact that the earth and the heavens were an integrated mass before they were split? We asked whether the Prophet could have had a telescope concealed under the sand dunes, a telescope as sophisticated as the Hubble telescope? Are the unbelievers going to claim now that Muhammad discovered the primeval unity of the heavens and the earth by having recourse to calculations of the cosmic background radiation, and that he had sent his satellite long before the launch of COBE, 1400 years ago? Penzias and Wilson shared the Nobel Prize for the discovery. Would the unbelievers nominate Muhammad for the Nobel Prize for physics for having announced 1400 years ago that the universe had once been a whole before space began expanding? It is evident that anyone who contended that the Quran had not been sent by God, but was the work of the Prophet, would necessarily become an object of ridicule. However, those resolved to remain unbelievers would insist on their convictions regardless of all evidence being brought forth. So had it been with Abraham and Moses and Christ and so was it with Muhammad. The psychology of unbelievers has never changed throughout history. Those who opposed Moses declared that they would adhere to their own conviction, no matter what signs Moses would produce. Polytheistic beliefs have exhibited structures that differ according to the communities and times in which they have evolved. The polytheistic beliefs in ancient Egypt differ greatly from the polytheism of India. However, these systems have something in common. Every god has his apportioned domain where he exerts his sovereignty. The sun is a god, so is the moon… Some control the rains, others the winds; some have control over the mountains, some over the rivers… In opposition to belief-systems that parcel out the universe, the monotheistic religions, namely Judaism, Christianity and Islam, saw the universe as a whole. These religions professed that severance and sundering could not be imagined in a universe created by one God. According to these religions what seems to be divided is but in appearance only, while the essence of the universe is one whole; the universe ruled over by God is one entity, with every one of its points being interrelated with all the other points. Famous theist philosophers had tried to find a correlation between the occurrences in the universe whose logical conclusion would be the unity of God. In the aftermath of the Big Bang, this unity was once again proven. The origin of the universe was irrefutably one single composition. Considering that everything evolved out of this single entity, all elements should be in correlation with each other. No one could henceforth declare that the sun, the moon, man, the serpent or a plant had its respective creators. Unity lay beneath everything, and the Creator of this unity was also the Creator of the sun, the moon, the beasts and the plants that emerged from this unity. Even before the Big Bang Theory, the irrationality of the idea that attributed different creators to different objects was evident. 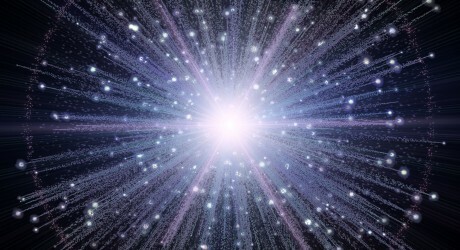 However, the Big Bang proved with new evidence that God is One.